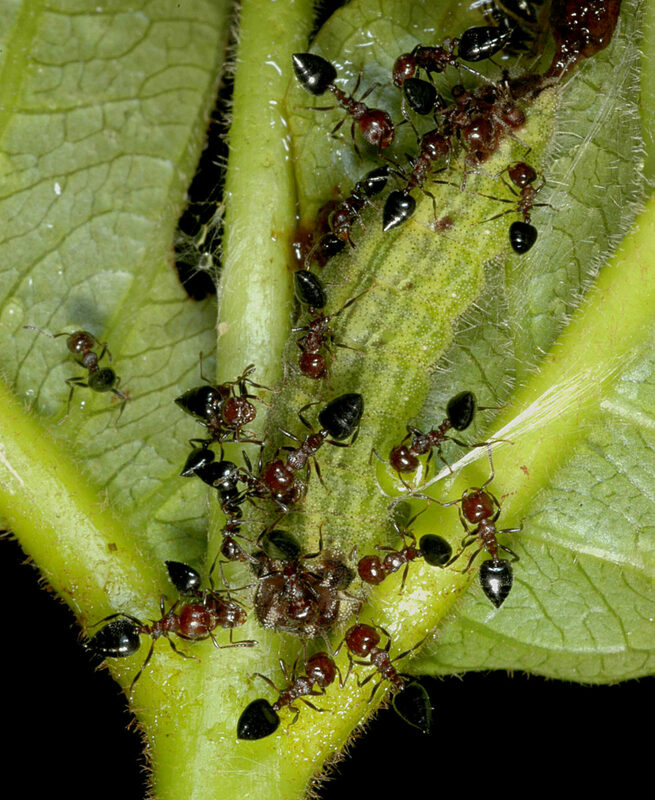 A tale of ants and aphids… or maybe, of the free childcare services provided by ants to the blue caterpillars. Ants are important, highly effective and even specialized predators of many other insect species. But at the same time, a complex and often mutualistic relationship has evolved between ants and other insects. As many as 100000 insect species interact with ants. The vast majority of these are happy relationships, either a simple and peaceful coexistence or a mutually beneficial relationship where both the ant and the other insect species gain something from each other. If the caterpillar is discovered by a dark reddish ant (an ant in the genus Myrmica), then it will go through a process known as adoption. If any other type of ant discovers the caterpillar, however, it will be treated like any other caterpillar, which usually means being eaten. During the adoption procedure, a Myrmica ant will touch the caterpillar all over with her antennae. During this time the caterpillar may secrete a droplet of a sweet secretion from a special gland on its back, which the ant drinks. After a while, the caterpillar will flatten the rear or middle of its body, and the ant will pick the caterpillar up and carry it away. In another case, the ant will carry the caterpillar back to the ant nest and place it among the ant larvae. Once inside the ant nest, the caterpillars are fed by the ants much as if they were their own larvae. Worker ants regurgitate liquid food that the caterpillars drink. The ants seem to prefer feeding caterpillars to feed their own larvae so that fewer ant larvae can develop. Although caterpillars will be adopted by any Myrmica ant species that finds them, they are able to survive in the nests of one or two species of ant. If caterpillars are adopted into a nest of the right species of ant they will grow rapidly, increasing in weight about 100 times in their first month in the nest. They will stay in the nest throughout the autumn, winter and spring, and will turn into pupae in the early summer. On the back of caterpillar, there is a large secretory organ found toward the rear end of many lycaenid caterpillars. In most lycaenids that possess it, this glandular organ produces droplets of a honeydew-like liquid which are eagerly consumed by ants. In the large blue butterflies, it only seems to be used during the adoption process, where a droplet of secretion is provided for Myrmica ants which find a caterpillar in the field. Yuwaraj Gurjar works with Raymond Limited - a renowned textile manufacturing company, but his love for nature always drives him to go places into wild India – being hugely diversified habitats. He has traveled across the country & Sri Lanka for nature observations and photography. His photographs have won many national and international awards; have been exhibited across the world. Some photos were included in field guides, educational websites and magazines. He actively spreads the awareness & knowledge about nature, wildlife & photography especially Macro Photography. He has developed a free Mobile App on Butterflies of Mumbai named “I love Butterflies”.